Today, corporations are expected to give something back to their communities in the form of charitable projects. In Corporate Social Responsibility, Philip Kotler, one of the world's foremost voices on business and marketing, and coauthor Nancy Lee explain why charity is both good P.R. and good for business. They show business leaders how to choose social causes, design charity initiatives, gain employee support, and evaluate their efforts. They also provide all the best practices and cutting-edge ideas that leaders need to maximize their contributions to social causes and do the most good. With personal stories from twenty-five business leaders from socially responsible companies, this is the bible for today's good corporate citizen. PHILIP KOTLER is the S. C. Johnson Distinguished Professor of International Marketing at Northwestern University's Kellogg School of Management. One of the world's top authorities on marketing, he is also the author of thirty-five books, including Marketing Insights from A to Z, also from Wiley. NANCY LEE, MBA, is President of Social Marketing Services, Inc., and a marketing professional with more than twenty years of experience. She is an adjunct faculty member at the University of Washington and Seattle University where she teaches marketing. 1. The Case for Doing at Least Some Good. 2. Corporate Social Initiatives: Six Options for Doing Good. 3. Corporate Cause Promotions: Increasing Awareness and Concern for Social Causes. 4. Cause-Related Marketing: Making Contributions to Causes Based on Product Sales. 5. Corporate Social Marketing: Supporting Behavior Change Campaigns. 6. Corporate Philanthropy: Making a Direct Contribution to a Cause. 7. Community Volunteering: Employees Donating Their Time and Talents. 8. Socially Responsible Business Practices: Discretionary Business Practices and Investments to Support Causes. 9. 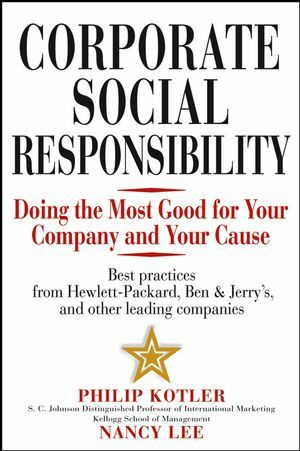 Twenty-five Best Practices for Doing the Most Good for the Company and the Cause. 10. A Marketing Approach to Winning Corporate Funding and Support for Social Initiatives: Ten Recommendations.